Is your child or teenager struggling with physical or mental health issues? Do you think what they’re eating may be the cause? 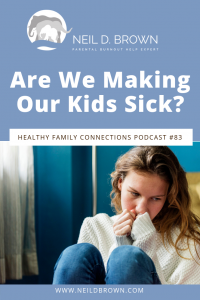 We’ll talk about this and more on this week’s podcast: Are We Making Our Kids Sick? My son is 16 and has a serious case of IBS. He’s on medication but he still has serious symptoms. He is often late for school because he can’t get out of the bathroom in the morning. He gets decent grades; B’s and C’s but he could get straight A’s if he wanted to. He usually has to pull his grades up at the end of the grading period and he settles for passing. He loves video games and we limit his access, but it’s a constant struggle to get him to do his work. He sees a therapist for anxiety and I think it helps him; he likes his therapist and doesn’t resist going. I know he should be eating better but he’s 16 and I can’t control his eating. When I try to talk with him about it, he shuts me out. The problem is that he resists, sneaks, argues, and we can’t get him to take better care of himself and be more responsible. We’re worried about him and don’t know how to help him. Thanks for your question Carol, and it is an important one. I’ve worked with many families that sound like yours over the past few years, so you are not alone. There are several issues here to discuss so let’s get started. IBS or irritable bowel syndrome describes a long list of symptoms and your son’s serious diarrhea is one of those. IBS describes the symptoms and doesn’t designate the specific disease but regardless, actively creating gut health is vital. I’ve said this before and I’ll say it again, we can’t rely on medicine or the medical community to make us happy or healthy. Happiness and health belong to us and if we take responsibility for them, generally speaking, we’ll do great. So, if your son has IBS and isn’t taking responsibility for it, he’s going to stay sick and get sicker. Our gut is where we get nutrition, it’s where we are protected from toxins, it’s where our immune system lives, and it’s where serotonin originates. A healthy gut is vital to our physical and mental health. So your son’s IBS and anxiety may very well be related and as long as he is suffering from these symptoms, his long-term health is at risk. Some medical professionals believe autoimmune disorders are related to poor gut health. So it’s absolutely vital that healing his gut becomes a priority. But, it doesn’t sound like your son takes responsibility for his eating, his school work, or his relationship with his parents. So while your son is struggling with IBS, and related to that, leaky gut syndrome, you are struggling with disempowered parent syndrome. Leaky gut means that the foods your son eats have injured the gut lining in his intestine. The ratio of good bacteria in the gut, which supports healthy digestion, and bad bacteria which interferes with digestion, are out of balance and the bad bacteria are winning. This allows the gut lining to be permeated by toxins and we get bad digestion, bad nutrition, and toxins that make us unhealthy and sick. That’s leaky gut syndrome. Disempowered parent syndrome is when parents are in a Control Battle with their child, teenager or young adult, and feel helpless. And being in a Control Battle leads to parental burnout, leaving parents with fewer resources to effectively address critical issues with their kids. What you want Carol, and you are right to want this, is your son to own and take full responsibility for his schoolwork, own and take full responsibility for his health, and of course, that includes treating his IBS correctly and aggressively, and be respectful when his parents engage with him. Nick, you are a truly amazing kid. Everything you’ve put your mind to, you’ve succeeded at. All the way through your middle school years, you were a terrific athlete. I know you weren’t a top player, but you brought your full self to the practices and games and made a difference. You were happy then. You played trumpet in the school band and you guys sounded great. When you volunteered at the kids’ summer activities program this summer, the director couldn’t say enough good things about you, and of course, you know your sister adores you. Those are just a few of the many, many wonderful things we could say. And perhaps even more importantly, regardless of what you are or aren’t good at, we just love who you are. So Nick, the bottom line here is that things have gone off track with you and us, and you aren’t doing as well as you should as a 16-year-old young man. You haven’t gotten out of the pattern of falling behind in school and you’re getting too old for your parents to monitor that and stay on top of your assignments. That needs to belong to you. I know gaming is compelling and calls to you, but either you can manage it and prioritize your schoolwork, or you shouldn’t have it. The most serious issue right now is your IBS. Yes, you’re mostly taking your medicine and it helps some, but your eating behavior is destructive and exacerbates your condition. I know when you’re out with friends you want to eat what they eat. But you know Angie who has diabetes, she doesn’t eat what all the other kids eat. If she did, she’d kill herself. Your situation is exactly the same. Your stomach cramps and diarrhea are symptoms of a disease just like high blood sugar is a symptom of Angie’s disease. Your symptoms won’t go away unless you address the cause, and it's up to you to get on top of it and figure it out. Medicine is good, but you need to learn what you need to eat and what you absolutely must not eat, because that’s the only way you are going to get better. We can’t get this figured out for you. We can partner with you and get the experts involved, and when we know the right foods we can get them, and cook them. But ultimately, it’s your body and your health issue, and you need to be in charge of it, not us. We have an appointment with a nutritionist who specializes in IBS and with us supporting you, you are going to need to get this right. Get on top of and stay current with your assignments. No missed or late assignments, no excuses. We expect 90 minutes every night with no gaming or videos. Instead you need to be working, organizing, reading and studying. Don’t tell us you don’t have any homework or “I finished it at school”. There is plenty to do during 90 minutes in order for you to do your best work. You need to find some recreational activity other than video games and engage it regularly. It could be mountain biking, getting a group and playing trumpet again, bird hunting with your uncle like you used to, it’s up to you. You must respond respectfully and cooperatively when we talk with you. No more just shutting us down. You'll need to learn what you can and can’t eat, and make healthy choices. You need to get on the road to serious intestinal health. That has to belong to you, and it needs to start now. We will support you 100% in all of these things and we know you can do it. You are fabulous. Get it, Carol? You need to be clear, strong and positive. That’s the way you’ll get your son’s best, the way you’ll end Disempowered Parent Syndrome, and that’s how your son will end Leaky Gut Syndrome. So parents, Carol is facing an issue with her son that represents an issue we all are facing: Food in America, what we are eating and feeding our kids. It’s tough because figuring out what is healthy and what isn’t can be a moving target. But, the bottom line is our kids are fatter and less healthy than they used to be. I read a statistic recently that said one-third of all kids eat at least one fast food meal a day. And we sure as hell know that that isn’t healthy. We know sugar isn’t healthy and that chemical sugar substitutes aren’t healthy. We know that vegetables are healthy and that we aren’t eating enough of them. In fact, our diet should mostly be vegetables, and I don’t mean French fries. We also know that organic foods have fewer toxins and are better for us. But, we’re letting the agricultural industry dictate our eating habits and it’s making us sick. Jennifer Scribner is a nutritional therapy practitioner who wrote a book titled, "From Mac and Cheese to Veggies, Please: How to get your kid to eat new foods, end picky eating forever, and stay sane in the process". Her book is loaded with important information about how to switch eating habits in your home, including with “picky eaters”. She has clearly faced every situation and kind of resistance to healthy eating, and she has an experienced and positive response to every one of them. There’s even a section on detoxifying your home with easy recipes for making your own personal care items such as toothpaste. So go on Amazon or her website and grab yourself a copy. But the bottom line is, everything we put in our bodies matters. Loving and caring about our kids needs to include teaching them that what they eat, what they put in their bodies will bring sickness or health. Thanks for tuning in today everyone and thanks to Carol for your very important question! Please remember, take care of yourselves, you need it, you deserve it, you’re worth it. Bye for now.